Caspia Hotels takes care of your sleep, breakfast and WiFi needs like no other. Whether you are on a business trip or leisure, you’re guaranteed comfort and outstanding quality at all our hotels across India. Caspia Pro is a self-service hotel concept that is renowned for delivering a great sleep and shower experience. It promises a comfortable stay with the best value assured across all its hotels in India. A warm, friendly welcome awaits you at Caspia. Unbeatable prices for great hospitality. 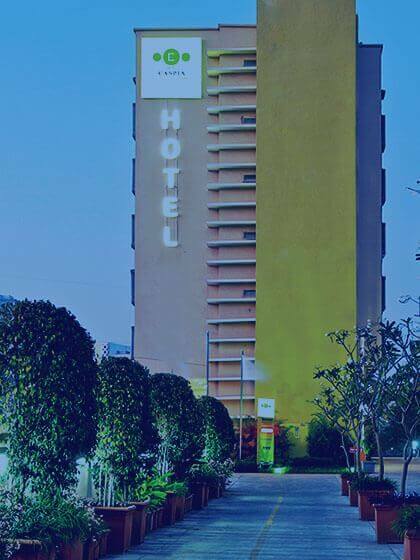 Whether you are on a business trip or leisure, at Caspia Hotels you’re guaranteed comfort and outstanding quality at all our hotels in the city of New Delhi. Caspia Pro is a self-service hotel concept that is renowned for delivering a great sleep and shower experience. Caspia Pro is now present in Ahmedabad, Bengaluru, Gurgaon, Greater Noida, Pune Hinjewadi, Pimpri, Nashik, Chennai and Hyderabad. Caspia Pro, values time and needs of its guests and promises efficient services ensuring the best value for money. When all you need is a perfect night’s sleep, Caspia and Caspia Pro Hotels has just the right bed for you. As you wake up after a relaxed sleep, feel rejuvenated with a refreshing shower at Caspia Pro. With double glazed windows, all guest rooms are completely sound-proof to offer you a serene atmosphere during your stay. Caspia Pro offers uninterrupted free Wi-Fi at all its hotel locations in India. Get the perfect start to your day with our perfectly-cooked breakfast. Equipped with latest technology, Caspia Pro provides you a 24/7 hassle free security. Also, ensuring a quick check-in, check-out process. Stunningly luxurious guestrooms offers an ideal match for all travelers. The room categories include deluxe and superior rooms along with discreet technology for a splendid stay experience. Fully air-conditioned, with unlimited free Wi-Fi access to make sure you are always connected. Each room features an en suite bathroom with bathtub and shower facilities, a flat screen TV with cable service, tea and coffee maker and a work desk, and if you need anything more just ask our friendly staff. All Superior rooms offer space and functional work area. Draw back the lined curtains and enjoy superb views of the city in many of these beautiful rooms. The Deluxe rooms provide spacious accommodation. Discover the deluxe experience, designed to make your stay truly unforgettable. The hotel offers dining options to tantalize your taste buds, at our in house restaurants. For your convenience, 24 hours of room service available. Dine at Linx, our multi-cuisine restaurant offering a range of Indian, Oriental and Continental dishes to best suit your taste. Unwind at 87 for some drinks, cocktails and snacks, and make use of Happy Hour deals every evening. Enjoy the spacious outdoor terrace to relax and unwind. You'll find plenty of ways to keep busy and have fun without ever leaving the hotel. There's nothing like a refreshing dip to awaken the senses! Our swimming pool is located on the Terrace, the guests can enjoy light snacks, and relax in the sun. Stay in shape at our on-site fitness centre, which is open 24 hours a day for your convenience. We have everything to help you get a good workout. Guests can also take up a scheduled exercise class with a professional instructor on board. A perfect location for small or large meetings or a wedding reception – just get in touch and we’ll do the rest. With key features like free Wi-Fi, refreshing breakfast, access controlled compact sound proof rooms, the hotel is a clever choice when you need a great night sleep at an exceptional price. The hotel with its round the clock safety and security, convenient location and express check-in and check-out make it an ideal choice for corporates and leisure travelers. The compact and cozy room offers bottled water in all its rooms. The room features flat screen television airing several national and international channels. With 100% cotton sheets, one can be assured of the best quality bedding providing a great sleep experience. All guest rooms at Caspia Pro have a work table, open wardrobe, bedside reading lights, bathing towels, soap and soap dispenser and a LED shower in restrooms. The rooms are stylish, functional and clean. Caspia Pro in India offers a complete 'Rest Assured' stay experience with a unique Self-service concept, which makes it an ideal choice of hotels for the modern Indian traveller. The hotel rooms are compact and cozy and features flat screen television, storage area, writing desk, hot and cold shower bathroom, sound-proof windows and access control doors. With 24 X 7 security and access control lifts, keycard-operated door locks, visual alarm for common areas, and CCTV cameras; the hotel provides undoubted safety to its guests. The hotel also offers great location and is conveniently located near shopping, dining and entertainment options.